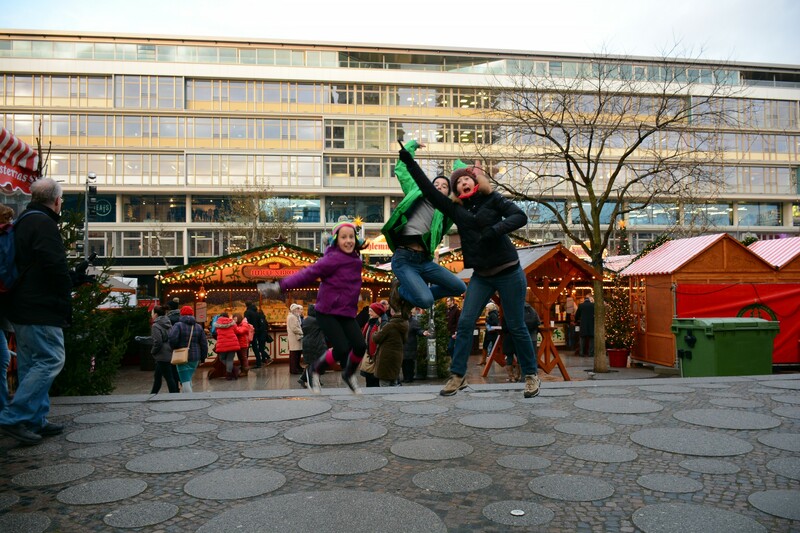 Arriving in Berlin, we journeyed to our apartment passing monument after monument. 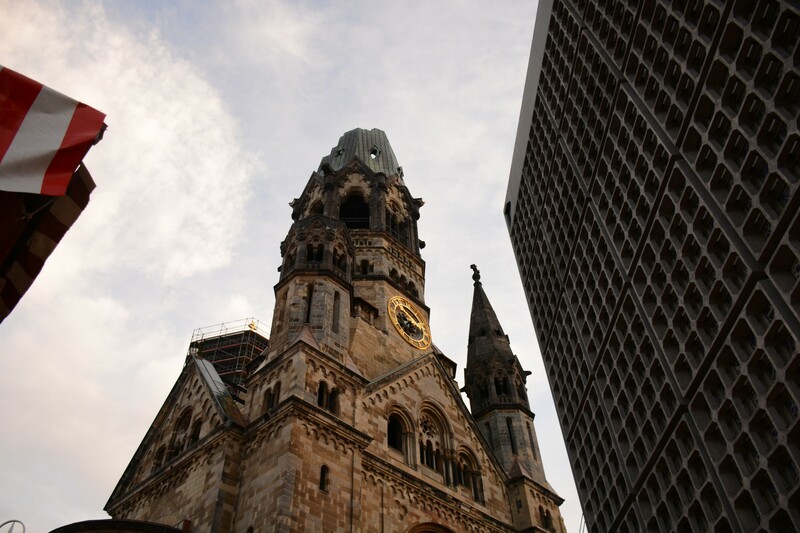 The city showed a glimpse of its place in the history of the German nation. We had certainly moved from “ye olde worlde” Bavarian provincial feel to a city that is making its way back as a global capital. Our apartment had a slightly East German, but homely, feel to it. After checking in, we visited the local supermarket and spent a fun filled hour playing “guess the ingredients” and trying our luck buying groceries in an unknown language. Cereal with Knuspers ? Why not! 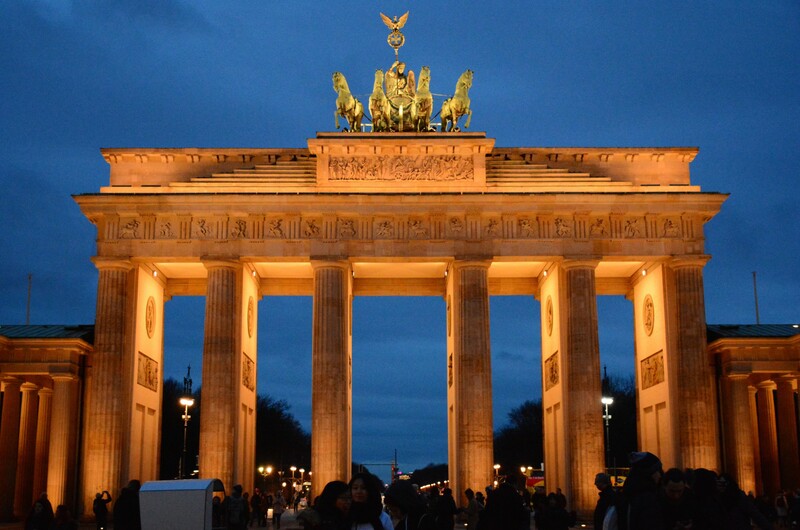 As night fell, we still had a few hours before dinner so we headed out to the Brandenburg Gate. Situated at the junction of two grand boulevards, the Gate projects an imposing presence as an entry into the city. Thinking it must have been some grand monument by a previous ruler to himself, we discovered it was the only remaining gate of 14 built as toll booths to collect taxes for people coming into the city! No half measures here. 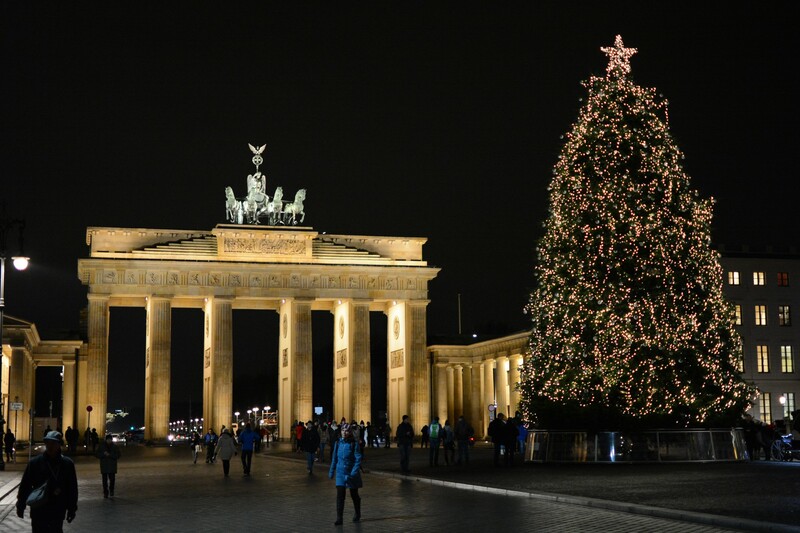 Brandenburg Gate, with a bit of Christmas. We walked through the Gate daily on our way to other parts of Berlin, enjoying the monument at many different times and in many different lights. Fortunately without the need to pay any tax! 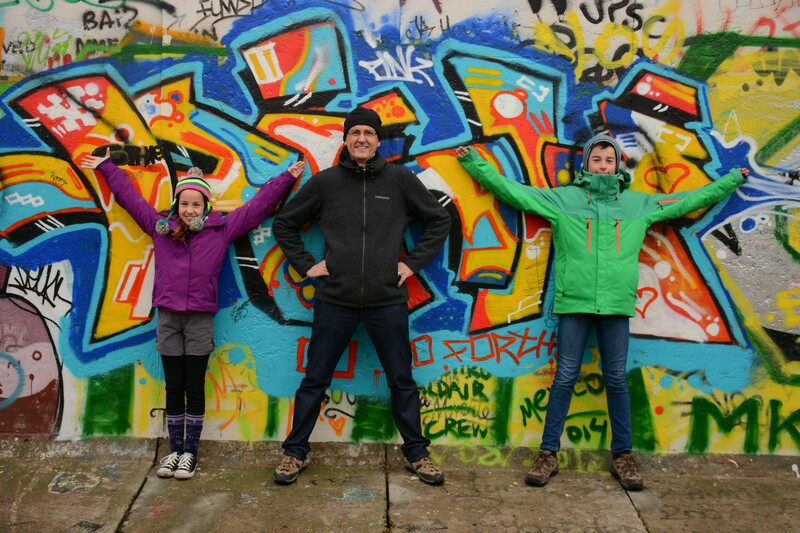 As we explored Berlin, we found ourselves wondering which side of the Wall we would have been on. Interestingly, the Brandenburg gate was in the exclusion zone of the Wall and neither East nor West. Our apartment would have been in the East and the Reichstag in the West. Its seems, though, that the East had the vast bulk of the civic and landmark buildings, the majority of the historical areas, the museums, cathedrals landing on that side. In the 25 years since the wall came down, the centre of the city and most civic buildings have been wonderfully integrated and regenerated. 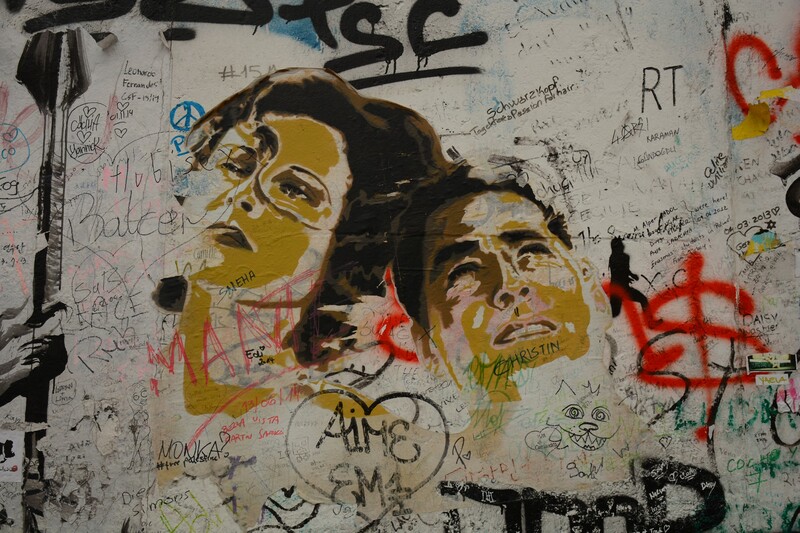 Along the River Spree there remains a long section of the Wall which has been turned into an art gallery, resplendent with graffiti, much in the style of old West Berlin. We wandered along this section of the Wall checking out the art. Wall Art with community contributions! The original Checkpoint Charlie booth has gone, and a replica has been put in place. manned by men looking like soldiers, collecting fees for photos. The original signs are still there. 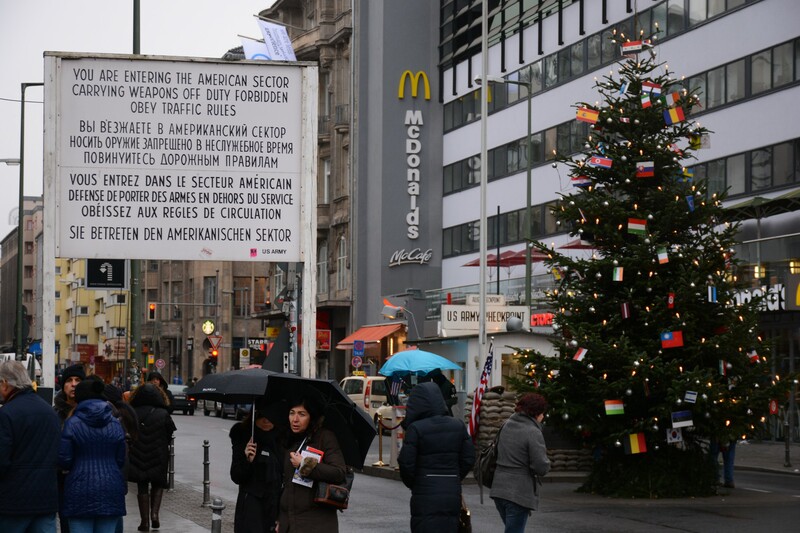 However… strategically placed symbols of the West loom large over Checkpoint Charlie as a reminder of the evils of capitalism. We visited a great museum at Checkpoint Charlie that told much of the story from WWII right through to the fall of the Wall. 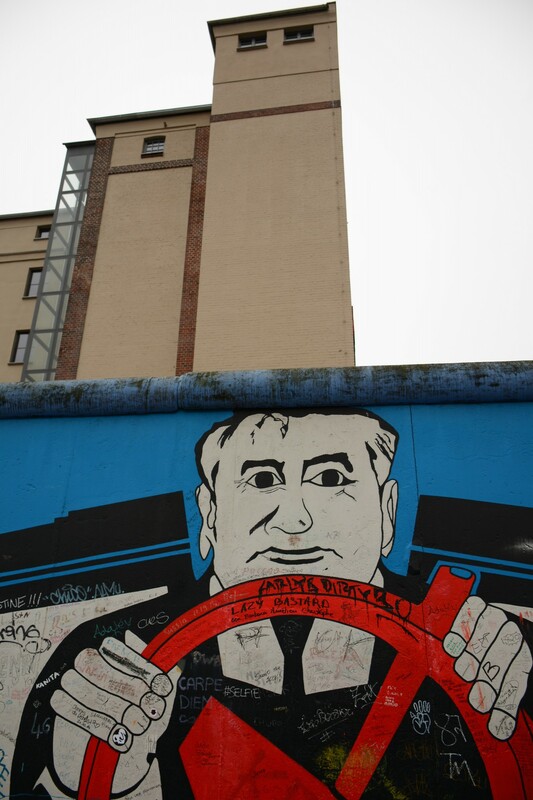 Fascinating articles, memorabilia, videos and actual escape vehicles could be found, providing depth to our understanding of Berlin during the East/West cold war. Next door to our apartment was the Holocaust memorial. It was a sombre place under grey clouds early in the morning. 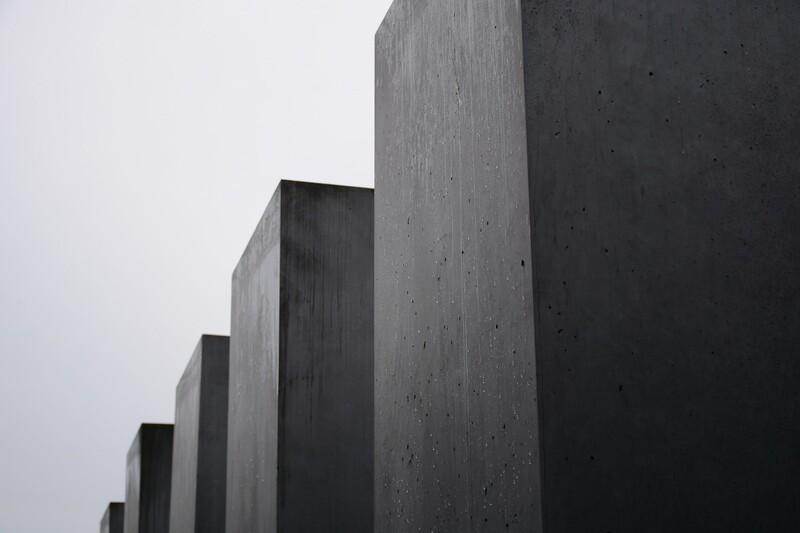 As you are drawn into the memorial, down rows of concrete blocks, you become swallowed in the depths of grey. On the surface it does not seem much. Deep within it, you become lost. 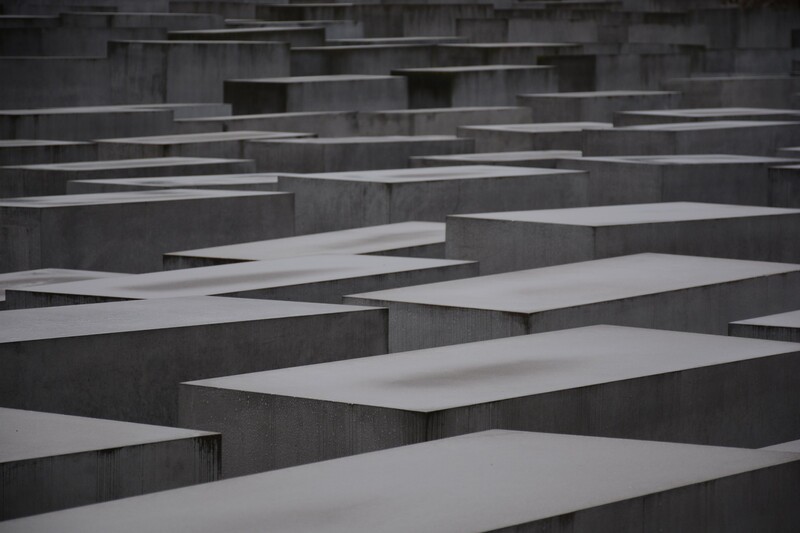 Holocaust Memorial, on the surface. Holocaust Memorial, cold, bleak and grey. The Reichstag, rebuilt for the German Bundestag (parliament) by Lord Norman Foster, features a fantastic dome at its centre. Visitors can wind their way up to the top and look out over Berlin. 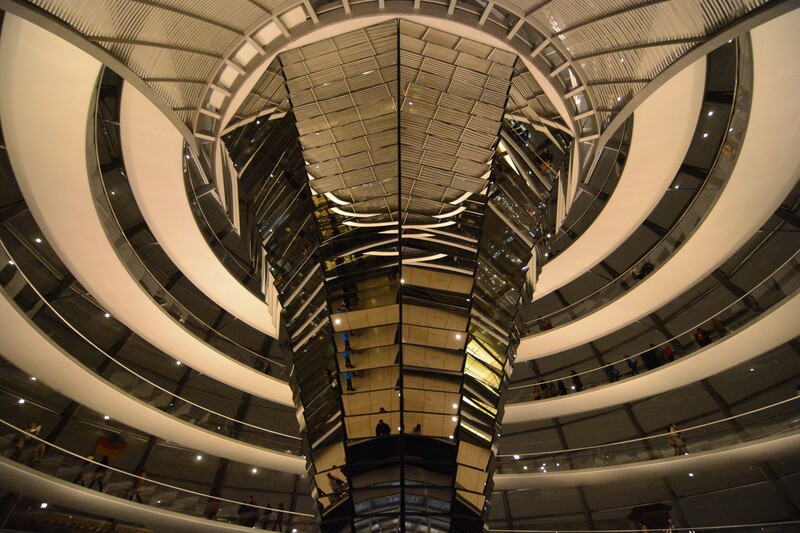 It’s design also enables the people to look directly down into the heart of the Bundestag chamber and a cone of mirrors reflects these views of the chamber out the dome over Berlin. 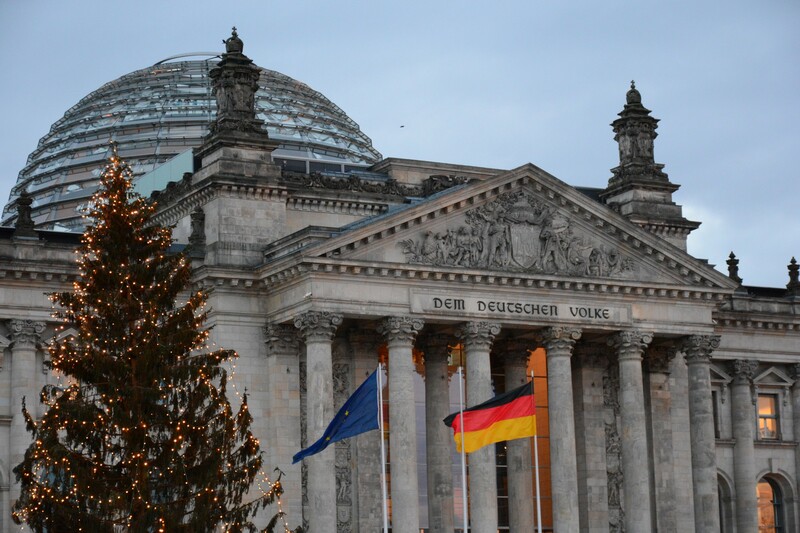 It was cold and dark but it was a great walk up to the top of the Reichstag. 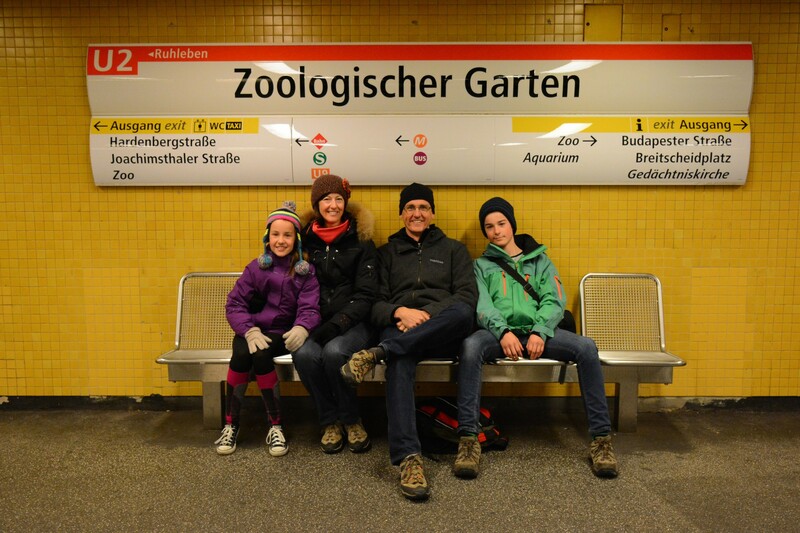 The cultural highlight of Berlin was our trip out to Zoo Station on the U2 line. Cool. A fascinating account and memory jogger for us! Great pictures again. Guess you are in UK now enjoying some more wintry weather. Love from us. Oh Berlin. Would to have unlimited funds and an apartment in Berlin. Zac and Oskar found the check point charlie museum just – well – outside their experience. The way east Berliners escaped absolutely fascinated them. We as you have too, found many changes from previous visits. Aren’t the Christmas markets just fun in the early dark evenings…magical. 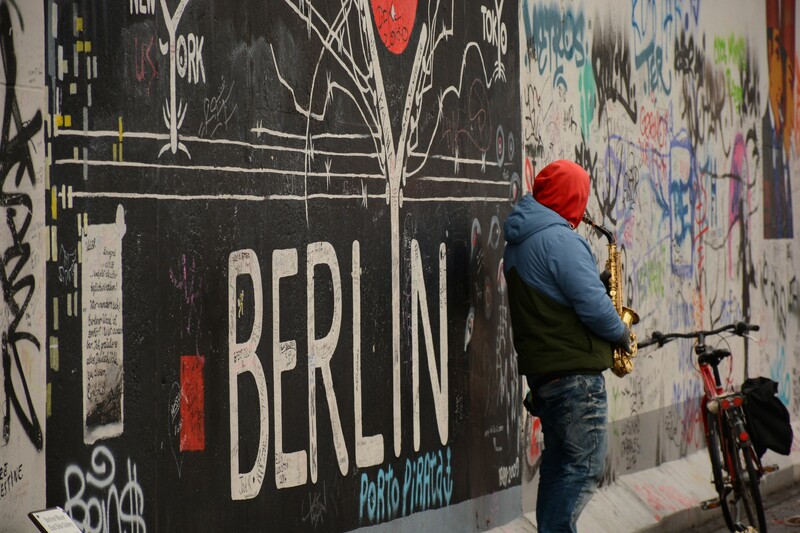 We loved revisiting Berlin through your photos. I think those crazy antics are caused by nibbling too many knuspers! So glad you walked to the top of the Reichstag. I thought that Mr Foster’s design was breathtaking. Thanks for your blog, it will be wonderful following you through the ten cities. 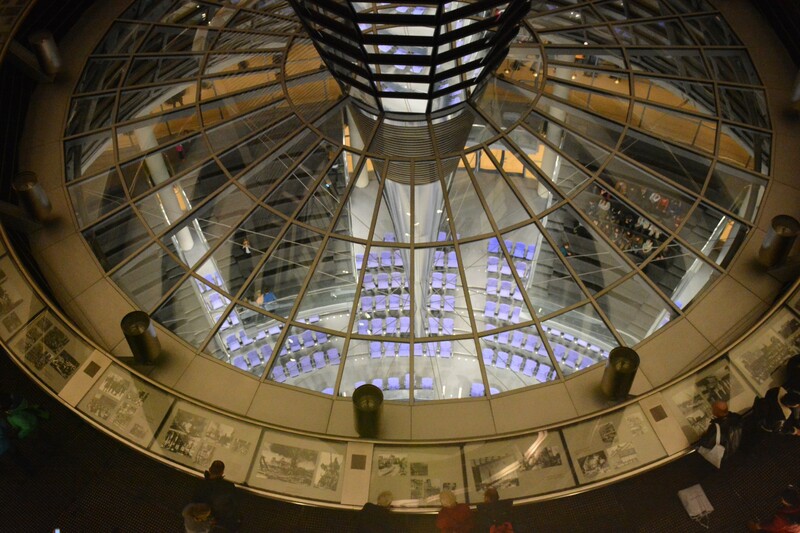 Awesome to see inside the Reichstag – it was still under reconstruction when I was there.